Explores the taboo topic of death and asks the fundamental question: How can understanding death give meaning to our lives? What if contemplating and facing our mortality allowed us to live our lives more fully, without fear? What if embracing our own mortality gave us a freedom that we never knew was possible? Or allowed us to live each moment to its fullest and experience life as an infinite unfolding of experiences each one more beautiful than the next? 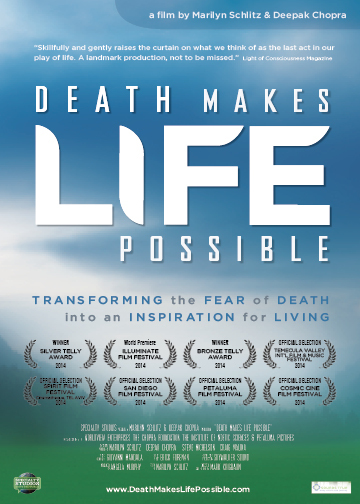 Death Makes Life Possible follows cultural anthropologist and scientist Marilyn Schlitz, Ph.D, as she explores the mysteries of life and death from a variety of perspectives and world traditions. Sparked by her own near death experience as a teenager, Schlitz has been delving into the nature of consciousness and death for the past three decades. The film features some of the leading scientists, anthropologists, philosophers, spiritual teachers and thinkers of our time - including Yassir Chadley, Deepak Chopra, Mingtong Gu, Stuart Hameroff, Lee Lipsenthal, Edgar Mitchell, Dr. Dean Ornish, Dean Radin, Tony Redhouse, Rupert Sheldrake, Rudi Tanzi, Luisah Teish, Jim Tucker and others. Death Makes Life Possible offers inspiration and hope about the ultimate question facing each of us. "Highly recommended. Deeply personal, yet universal in scope, Death Makes Life Possible is not just about how to die peacefully and gracefully; more importantly, it describes how to fully live." "Stunning in terms of beauty, richness of detail, heart and wisdom. Brings tears and inspiration." "A superb training opportunity for professionals who work with families facing death. Told through riveting personal narrative and scientific evidence, the film deepens our awareness of continuity of consciousness to reframe the entire journey." "Death Makes Life Possible skillfully and gently raises the curtain on what we think of as the last act in our play of life. A landmark production, not to be missed."